Home > It’s a Miracle! That might be a bit of an exaggeration for what I am about to share with you. However, I seriously urge you to take heed of my advice; it could change your life. And I call it that because it is an epiphany; an inspiration to other condiments. Do you have the tools it calls for? An immersion blender is an essential tool for your kitchen. You can get a Cuisinart Smart Stick for about $30 at Costco. I received a Betty Crocker one as a gift before I even got married. It was so useful for pureeing soups or sauces while they are still hot and in the pot. I currently have an Oster brand immersion blender. For those of you who lack kitchen space, like, maybe you live on a boat or something, an immersion blender takes up very little storage space, too. 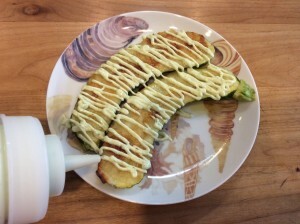 So, that smarty pants lady figured out how to make mayo with an immersion blender? Genius! Follow her lead: make sure you have the one-pint, wide mouth mason jar. It’s probably a physics thing, the whys of why that size works perfectly. Don’t worry about it; just go ahead and buy a case of them. They are the perfect size for storing things like sauces, or to use as a cocktail glass. I store dehydrated tomatoes and chiles in them, too. They are completely useful and worth the $15 or so investment. The brand of jars I have come with measurement markings on the side, so I save some dishwashing by pouring the oil straight in. The combination of oils that I currently use is: a long shot of extra virgin olive oil, and the rest of the cup, grape seed oil. They carry grape seed oil at Sam’s ($9 for a 1.5 liter bottle.) I also use more than 2-3 teaspoons of lemon or lime juice. I’d figure it’s more like 2 tablespoons, maybe a tiny bit less. Look at the instructions again before you start mixing; make sure you have all your ingredients ready. Add the egg, then the oil and salt. My advice is to wait until you have mixed the egg in to the oil (mostly, not completely) before you add the acidic lime juice. The acid will turn the egg into water if the two have extended contact, and your mayo will not emulsify into thick loveliness. I know this from experience, and from making Avgolemono. That’s a super tasty Greek soup where you mix eggs with lemon juice before adding them to hot broth. You won’t believe how the eggs turn into water until you try this! Don’t let it happen to your mayo! Now you are ready to experience the majesty of Miracle Sauce. 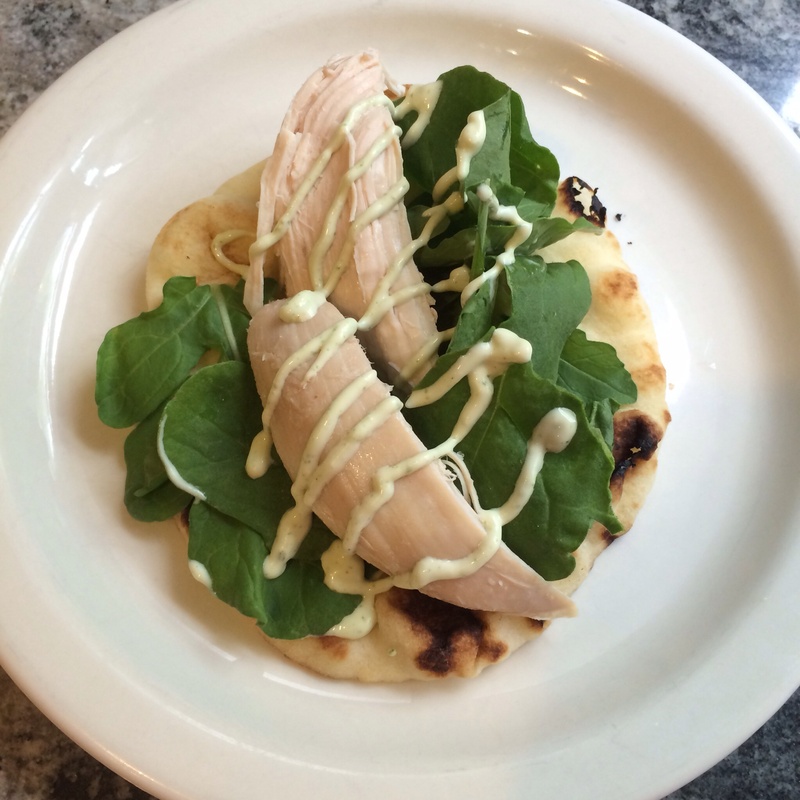 We mostly enjoy it on flatbread sandwiches: Indian naan, cooked chicken, arugula, crumbled feta cheese, and Miracle Sauce. Naan for you? Good; more for me! I’m kookie for cucumbers and Miracle Sauce! 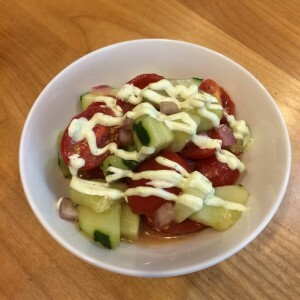 The salad is super easy to make: two cucumbers cut into chunks; a couple of handfuls of grape tomatoes, sliced in half length-wise; diced red onion (you pick how much you want!) the juice from half of a big lemon, or more if you like; salt, and a generous gluggy-drizzle of extra virgin olive oil. 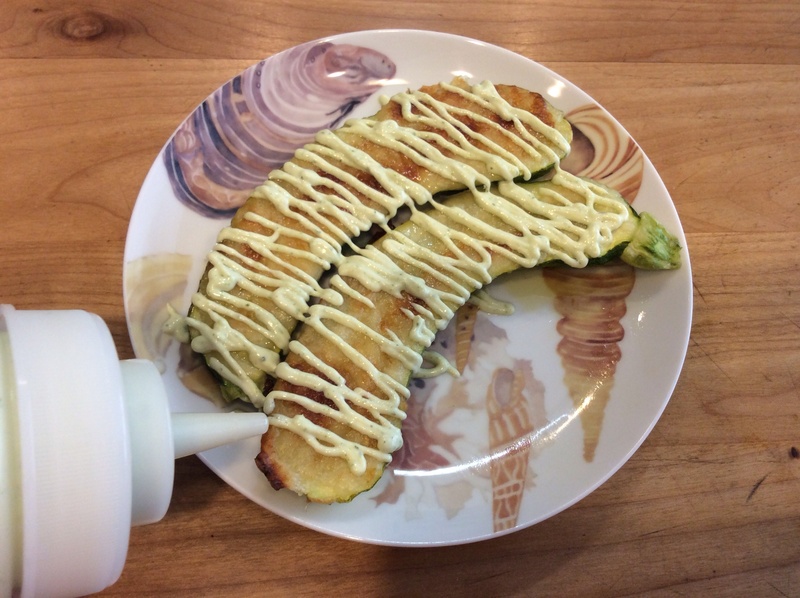 Try a little drizzle of Miracle Sauce when something you’ve made seems a little bleh, like steamed vegetables, maybe? Yummmmm! 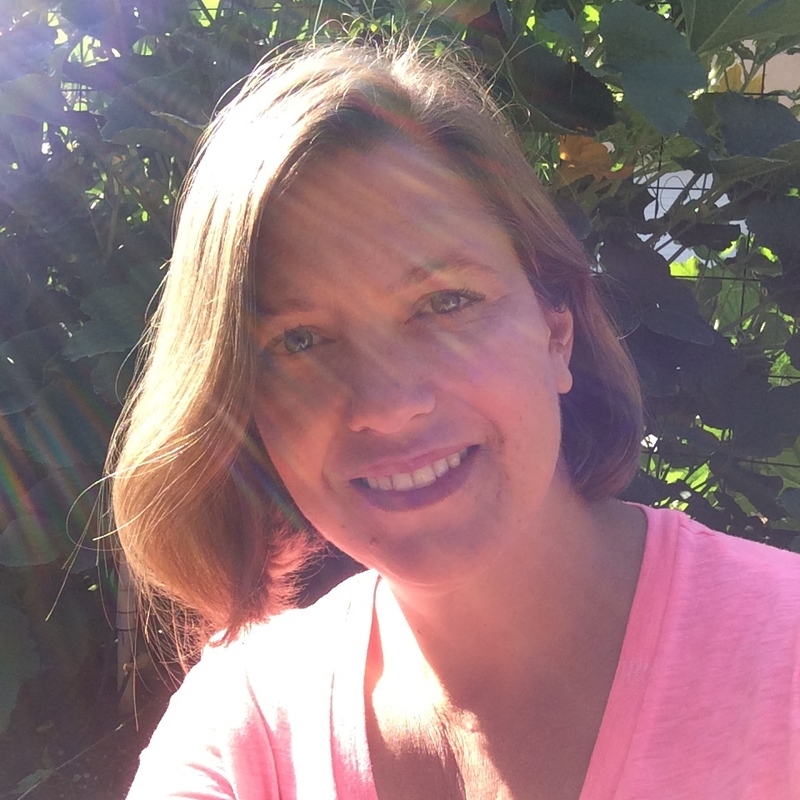 Looking over this post, I added up the cost of materials I so glibly recommended you buy. 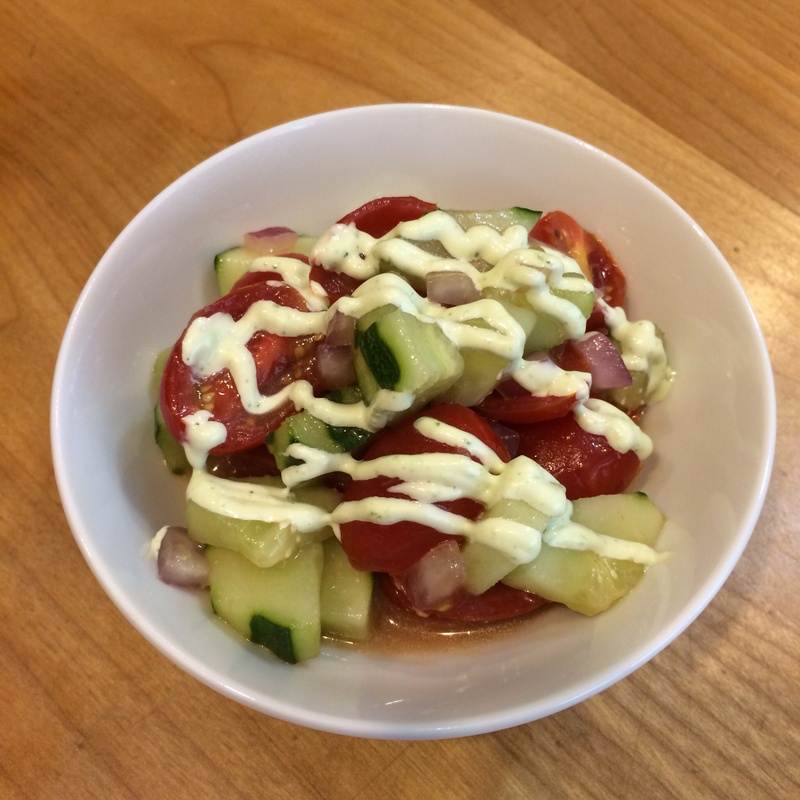 It comes out to about $50 – all for some homemade mayonnaise. Please do not invest in any of this stuff if you aren’t committed to making your mayo from scratch from now on! I wouldn’t recommend any of the items if they weren’t multi-functional, but still… Please don’t waste your money! Next Post Last week of school!